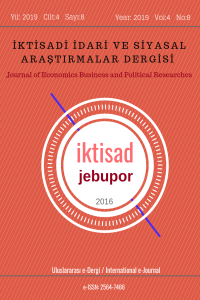 JEBUPOR is an internationally journal which is a scientific double peer reviewed, and its indexes are: DOAJ (Directory Open Access Journals), ERIHPLUS, Crossref, Central and Eastern European Online Library, Index Copernicus International, Find Economic Literatüre, Open Access Library, BASE, DRJI, Cite Factor, Academic Resource Index ResearchBib, International Innovative Journal Impact Factor (IIJIF), Scientific Indexing Services, Cosmos Impact Factor, Electronic Journals Library, SPARC Indexing, ESJI (Eurasian Scientific Journal Index), Open Access Journals, JIFACTOR, AcademicKeys, Systematic Impact Factor, Rootindexing, Science Library Index, Journal Factor, Scientific World Index, I2OR, Saif Scholars Impact, World Catalogue of Scientific Journals, Google Scholar, JISRAF, ITRDA, Society of Economics and Development, IARC Impact Factor, General Impact Factor, ISIFI, DIIF, AE Global Index, Scientific Journal Impact Factor, ASOS, Genamics Journal Seek. Submission Fee: JEBUPOR does not charge any article submission or article processing charges (APC). Click here to submit an article to the journal. Click here to see the Publication Rules, click here to download the sample template. Click here to see the indexing.